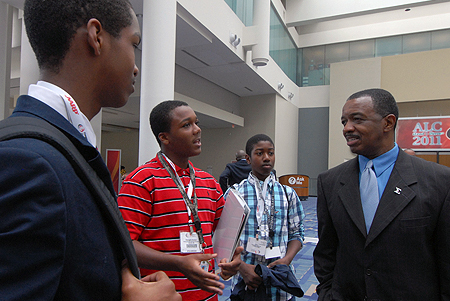 Carter D. Womack, president and CEO of Leadership At Its Best in Columbus, Ohio, talks with students at the Congressional Black Caucus event. Thirty-two African American 10th grade students spent the day in Washington, D.C., on Sept. 22 meeting with members of Congress and other leaders to continue developing their interest in national, state and local government. The students participated in a town hall meeting with Congressional leaders and met with mentors from the business community. The students will do a research project on a policy issue, present their findings, and be honored on Capitol Hill upon completion of the program. The program began in 2005 as a partnership among the Montgomery County Business Roundtable for Education, MCPS and then-Congressman Albert Wynn to foster high school sophomores interested in becoming more involved with public policy issues.